Ever ask yourself "I need a perfect gift that lets my loved one know how special they are?" This wine glass is the perfect choice for their special birthday! Rest assured our hilarious wine glasses are ready to gift wrap, packaged in a box strong enough to ship. Just click 'Add to Cart' for your hassle-free gift giving experience! 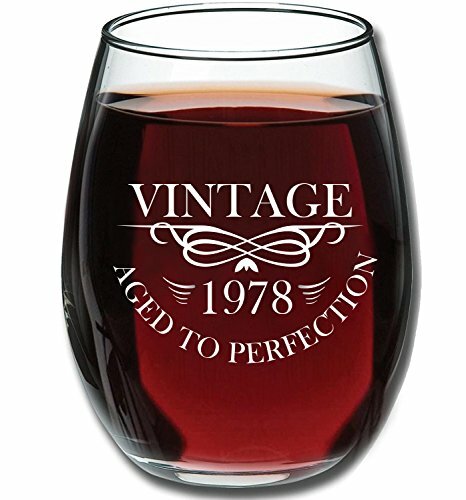 DON'T SETTLE FOR ANOTHER BORING GIFT: These personalized milestone wine glasses are the perfect gift for the next 40 year old birthday party, forty wedding anniversary or 1978 class reunion. It reads Vintage Aged to Perfection 1978 in vibrant white ink and is truly a permanent imprint that will never fade or lose its glow. CLASSY ERGONOMIC DESIGN: This versatile and elegant 15 oz. stemless wine cup offers excellent clarity for showcasing a variety of beverages! Use it to serve red or white wine, cocktails, or juice. Not only does its ergonomic shape create a sleek silhouette, it fits effortlessly in your hand. LOOKING FOR FUN PARTY FAVORS AND DECORATIONS? These beautiful novelty glasses are the perfect gifts to WOW your guests! Whether they're for a milestone 40th bday party or 1978 class reunion, men and women alike will be thrilled to drink their favorite wine from them for years to come. Buy them in sets of 2, 4, 6, 12 or more to make your next event memorable. A UNQIUE GIFT FOR THE PERSON WHO HAS EVERYTHING: Your husband or wife will adore drinking from this special wine glass with their birth year on it. Mom and dad will cherish their milestone anniversary for years to come! It will be their favorite drinking glass for your best friend, sister or brother.